In response to a Bulletin article about Protective Eyewear, one of our Canadian readers posted a personal story. His account demonstrates the importance of wearing eye protection whenever you shoot — no matter what type of firearm you are using — even air rifles. We hope all our readers take this to heart. All too often at rifle matches we see shooters, even some top competitors, risking their vision by failing to wear eye protection. 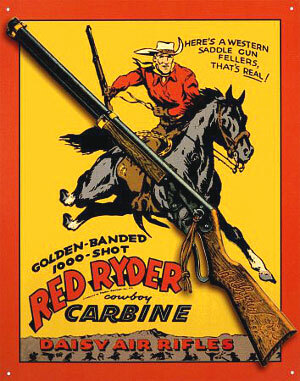 As a boy on a mixed farm on the plains the first shooting stick I owned was a Red Ryder BB gun. My Dad bought it for me as I showed a keen interest in the shooting and hunting sports. I was about 9 years old at the time. We had literally thousands of sparrows in our large farm yard and they liked to roost on the steel railings in the barn loft. I took to slowly thinning out their ranks by flashlight at night as these little winged pests settled in the farm buildings. One evening as I slayed sparrow after sparrow in the barn loft — with about a dozen farm cats following me to consume these easy meals, I fired at another bird centered in my flashlight beam. However, my aim was a bit low — and the copper pellet hit the steel beam square on. Instantly I felt a sharp pain as the BB bounced back and hit me squarely between the eyes on the bridge of my nose – drawing blood from the partial penetration into the skin. A half inch either way and I’d have lost an eye! Never, never, never shoot at any target with a steel background with any firearm, even a BB gun – is the hard lesson I learned, and wear the best shooting glasses that money can buy! Editor’s Comment: Among competitive pistol shooters, the use of safety eyewear is universal. You’ll never see Rob Leatham, Julie Golob, or Jerry Miculek competing without eye protection — for good reason. The handgun sports’ governing bodies effectively enforce mandatory eye protection policies. We wish the same could be said for competitive rifle shooting. 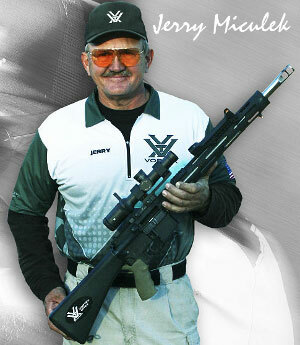 We often see benchrest, High Power, and F-Class competitors shooting without eye protection. We’ve heard all the excuses, yet none of them trump the safety considerations involved. We recommend that all shooters and hunters employ eye protection whenever they use firearms or are at a location where live fire is taking place. You only have two eyes. A tiny bullet fragment or ricochet is all it takes to cause permanent blindness in one or both eyes. As rifle shooters, we place our eyes a couple inches away from a combustion chamber operating at pressures up to 70,000 psi. I know quite a few guys who will religiously put on safety glasses when running a lathe or a drill press, yet the same guys won’t use eye protection when shooting their rifles — simply because it is “inconvenient”. That’s nuts. It doesn’t matter is you are a cub scout or a multi-time National Champion — you should wear eye protection. Be wise — protect your eyes. To learn more about eyewear safety standards, and to learn about the latest options in ANSI Z87-certified protective eyewear, read our article on Eye Protection for Shooters. Share the post "Why You Should Wear Safety Glasses"
The hunting tv community is the worst I have seen about not wearing proper safety equipment. Eye protection and ear protection included. Espically if hunting from a blind of some sort, it is crazy not to. Safety eye wear has saved my eyes many times, but I was late to learn my lesson for ear wear. Not to get off the subject. Now I don’t shoot anytime without them. Want to save what I have left. This article is spot on with their comment on F-Class. There is not a single person on the line that would consider shooting without ear protection yet many will forgo to use of eye protection. Safety glasses used to bother me on my T/R rifle due to the frame. I switched to the ESS glasses like the ones pictured in the article and problem solved. Nothing to get in the way of your vision and the kit comes with multiple lenses at a very reasonable price. I am not paid for this endorsement, but share it often on the line. As a result I am seeing more shooters turn to ESS for protective eye ware. Don’t risk you eyes or your ears. Wear your safety equipment. Keep up the good work on this issue. I see so many shooters who do their very best to expose their eyes to unnecessary danger. It really seems to come down to the fact that they don’t want anyone to tell them what to do. Any good ideas how to wear safety glasses together with prescription shooting glasses, the kind you use (when past 40 anyway) when shooting iron sighted match rifles?